There will always be ground that’s challenging to move through. Different terrain can be handled with the best UTV tires that can be properly matched to the conditions that your powertrain and chassis will have to overcome. With a range of affordable and well-built models in the market, you’ll have little trouble finding a set that can manage the kinds of ground that you are expecting to encounter. Roll through this list of UTV tire reviews to find a set that matches your all-conditions needs. It’s critical to choose a set of tires that match the range of terrain you’ll be passing through. A poor choice may not only be less fuel-efficient for your style of driving, you may find a lot of the ground you’re covering to be hard going or even impassable. You should select according to your own requirements for ride comfort as well as the difficulty of the terrain you’ll be facing. Models with taller, harder knobs and paddle-like patterns will get you the most grip on looser, wetter ground and more ragged trails. Tires with less open tread patterns can provide better control on hard-packed trails and other firms, even ground. They should typically perform somewhat more comfortably on roads and tracks as well. Most UTV tires sold are typically all-terrain models that are adaptable to a greater range of situations than other types. Lug trenches can be up to ¾ inch deep, with lighter-weight carcasses featuring between 2-ply and 8-ply construction. These offer high vertical and lateral stability and are built to get traction on more passable ground while providing for extra comfort. Due to their typically lighter rolling masses, they can be driven faster than other types. They also have more durable treads than mud-type designs. All-terrain models may not provide enough grip on the rockiest or loosest ground. These aren’t normally good substitutes for mud/snow models either, as their treads’ self-cleaning qualities are not as good as that of specialized designs. Deeper and wider treads can obtain more traction in muddy conditions. As they spin, their center ridges channel more dirt to their open sides, where the debris drops off. With less rubber in contact, wear and tear get more pronounced over time, leading to an increase in operating vibration. The specialized paddle-like lug patterns are not good for fuel economy, which is why mud/snow designs are not recommended for rides at higher speeds. These are specialized designs for traversing the kind of shifting ground found on beaches and in desert environments. These typically feature paddle or scoop-type treads that can grab material for better traction on loose surfaces. These are not meant for use on other than sandy or gravelly terrain, as they quickly lose stability otherwise. We don’t cover these as we are more focused on all-terrain UTV tires. Rock tires also specialized designs with heavy-duty tread blocks formed all over the flats and sides of their bodies, for extended grip in a variety of situations. These feature greater numbers of fabric plies to withstand severe bouncing and impacts over very rugged terrain. As with sand tires, we don’t include these pricey heavyweight tires in our reviews of all-terrain models. Race models are built for highly stable cornering and speedy performance on more regularly surfaced courses. Although these expensive and specialized designs are great for flatter track and road sections, our focus is on more affordable all-terrain or all-trail tires. It’s usually best to swap out your old tires with similarly sized designs. There’s hardly any speed benefit to substituting OEM tires with smaller models, for the resulting higher rotational rate may overstress your transmission and engine. Larger replacement tires are not necessarily better as well, for the bigger tire diameters will affect your UTV’s turning radii and fender gap spaces, possibly leading to rubbing underneath. The heavier mass will additionally stress the engine and may also result in a less comfortable ride. Narrower tires have decreased traction, and while wider models do gain increased traction, their wider contact areas can lead to issues with your UTV’s suspension geometry. Tire sidewall heights or aspect ratios will affect your machine’s stability and speed. Taller ratios will net traction more readily on rugged ground but normally offer less ground contact, and also tend to be less puncture-resistant. Tires with shorter aspect ratios can go faster with more stability, but may require swapping with larger rims to retain ground clearances. Bias-ply tires range from 2 to 8 plies in construction. Designs with higher ply ratings integrate more fabric layers in their structures, resulting in more robust carcasses with better puncture resistance as well as higher load capacities. Most UTV tires used for traversing rugged terrain are of the stiffer and more durable bias-ply type. 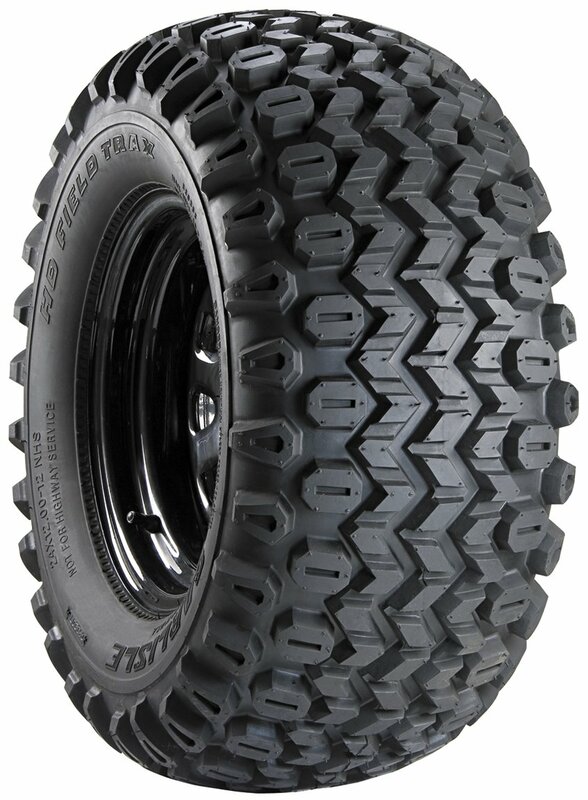 Unlike radial designs, bias-ply UTV tires flex less on flatter terrain, normally resulting in harsher rides on pavement. 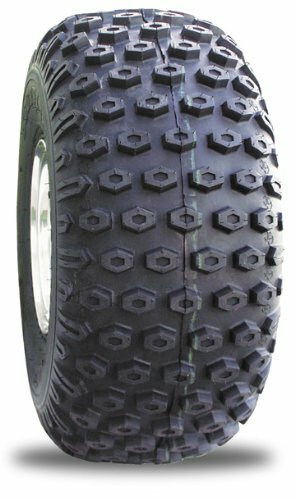 Kenda’s K290 tire is a bit of general-purpose UTV model that features probably the least aggressive treads of those reviewed here. It’s still a versatile design that normal UTV/ATV chassis can take advantage of in most terrain. Because it’s a middle performer, it won’t leave too many marks on grassy fields or otherwise tear up the ground. Rim guards are present to keep dirt and mud off the wheels. This model can handle both level dirt and rocky ground but doesn’t show superior grip or handling on any particular surface. Knobby hexagonal patterns do allow for smoother rides on harder surfaces, gaining traction on steeper inclines and wet shrubbery without churning up the ground. As it’s meant to be less of an uncompromising tire, the model has a slightly less durable and damage resistant carcass in comparison to more specialized off-road designs. The tread is not optimized for max traction during in muddy or snowy conditions, so it’s best for tooling on lighter errands around gently sloping lawns or dirt trails. With its robust construction and advanced tread design, the Kenda Scorpion K290 is a capable yet inexpensive all-trail tire that can hold its own in mostly even terrain. Kenda’s K538 is among the more specialized designs, even though it’s versatile enough to handle most terrain. No matter the level, this tire will achieve traction and roll on without fuss. Due to its crossover features, the ride maintains a firm and predictable grip even in the wettest and muddiest settings. The paddle profile improves self-cleaning while maintaining grip on hard-packed dirt. The heavily reinforced ridges are very durable. They are designed to gain traction while reducing the amount of knob rollover when tire pressure gets too low. The rigid bias-ply construction can meet the handling challenges of more severe 4x4 terrain, although at the cost of a rougher and bumpier ride. Rim guards help to protect the sides from damaging rock and branch hits. Due to its heavy pattern, the tread can leave marks on grass or dirt trails, so it’s more for cross-country jaunts than for resort or track duties. 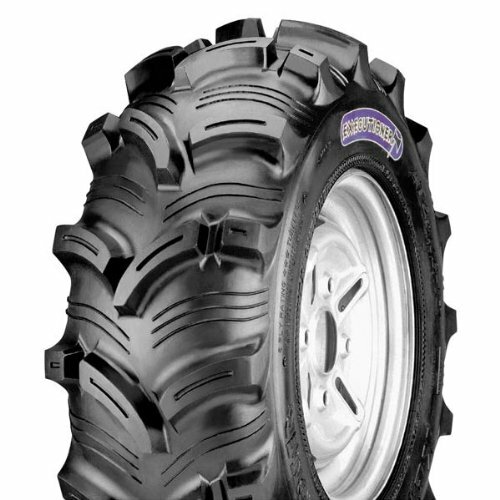 The Kenda Executioner K538 is a versatile yet inexpensive rough terrain tire with great traction on muddy ground or in deep snow. It’s one of the best UTV tires with decent crossover qualities. Carlisle’s Field Trax is a superior bias-ply design that gets reliable traction on most any type of ground. Only the rockiest or muddiest landscapes can faze this tire’s all-conditions performance. The zigzag tread pattern is opened along channels so as not to leave makes on grassy or dirt ground surfaces. The center works with the side ridges to apply more contact to flatter surfaces without compromising traction on rougher dirt. Its robust body can handle the weight of heavier passenger and cargo large loads on more severe 4x4 terrain. It also delivers a smoother ride with more predictable handling on pavement or hard trails. But as with most bias-ply designs, you can’t expect to drive fast without encountering more instability as you floor it. It also costs more than most of its specialized competitors. 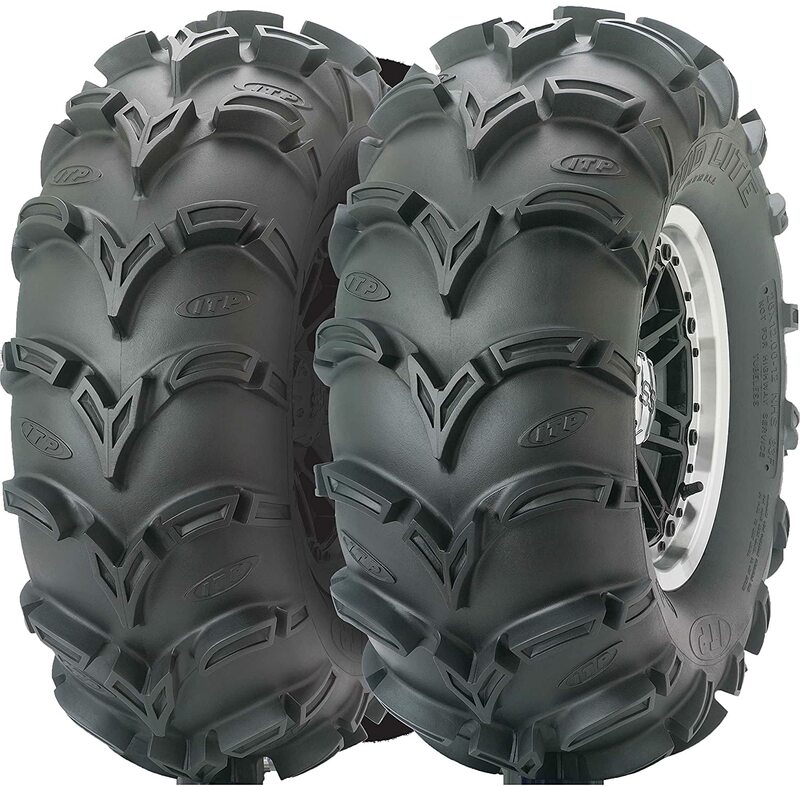 The Carlisle HD Field Trax is an all-terrain tire that rolls smoothly on even terrain and handles worse ground with some ease. It’s a good choice for rough riders looking for tires to overcome a variety of terrain and is our overall pick for best UTV tires. ITP’s Mud Lite is designed to track through mud and it’s decent enough in snow as well. Adventure riders will get a lot of traction wherever they go due to the heavy-duty design of the 6-ply body and the paddle-like deep treads. The angled shoulder lug pattern will bite into the muddiest ground for great maneuverability. It’s still capable of almost radial-type smoothness on flats as the area of the center ridgeline is designed to bring extra contact to the ground. The bias-ply construction provides for rigid sidewalls as well as tough tread areas for more predictable handling. The carcass is also built to be uncommonly durable, with six fabric plies adding increased strength. With its versatile all-conditions handling and traction, this is a tire that can readily get you across any rugged terrain that’s passable to UTVs. It appears it can be mounted on a majority of chassis, which makes it adaptable for fleet use. Like many bias-ply tires, you have to be careful about pushing speeds as these can become increasingly unstable the faster they roll. Installation is best done as a two-person job, with hub balancing performed with faster rotations. With its relatively affordable price, the ITP Mud Lite AT is our pick for handling terrain that tends to get deeply wet and muddy. UTV tires must be capable of negotiating a variety of rugged terrain and yet deliver a comfortable enough ride on flatter surfaces. ITP Mud Lite AT is our pick among the best UTV tires for off-road adventures and sports that involve tons of mud and snow. It’s the all-conditions choice for riders who will be facing a variety of wet surfaces. Carlisle HD Field﻿ Trax is an all-terrain tire that’s good for both trail and adventure riders, for it can readily handle most uneven terrain. It’s relatively comfortable to drive with on hard trails and roads as well. Off-roaders know that changing terrain puts their tires through a lot, and one of these should get you through most non-winter situations in the wild. If you liked this review, please leave a comment to let us know what you think of our utv tire reviews.